Holy mackerel, those two big pustules Alex Thomson’s built on the new Hugo Boss are ugly. He calls the twin cuddies ‘pods’. Mike Golding has nicknamed them ‘conning towers’. Golding has it right; his term is horribly apt. This boat might look weird but there’s a really very good reason for the shelters and cockpit right at the back: this boat is wet. Unbelievably, white-water wet. You need that protection. If you sailed on Hugo Boss for too long you’d end up like a river bed rock: sanded down to a nubbins and pitted with holes. Conning towers they are. 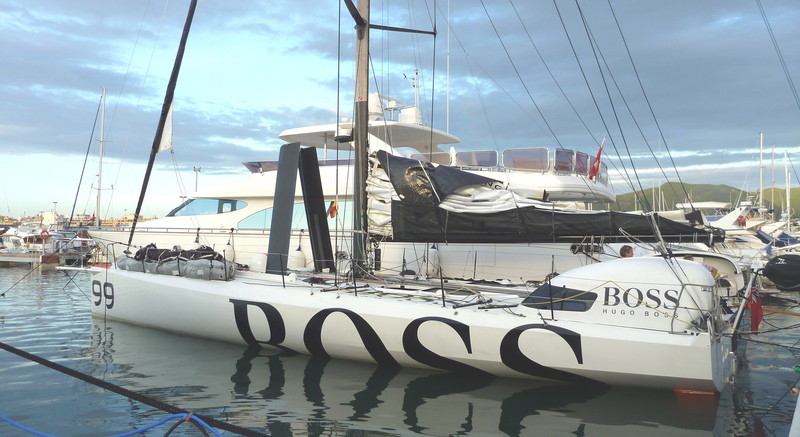 I’ve sailed offshore at speed on quite a few different generations of this class but Juan K-designed Hugo Boss is the most brutally wet I’ve ever experienced. By a long shot. For a taste of what it’s like have a look at the video clip below. It’s from our morning’s sail from Ibiza last week and it gives some small idea of what a monster this boat is. And what a blast. Sailing at a true wind angle of about 115° in 22-25 knots of true wind under reefed main and fractional Code 0 we were hammering along at 16-23 knots. It’s absolutely exhilarating. We five guests, all yachting journalists, were buzzed by our few hours on the water. It was like being parachuted in for a ride in the very best of Southern Ocean downwind sailing. The feeling on the helm is unbelievable. We had ideal conditions in the lee of Ibiza with slight seas, but even so the boat manages to slice the tops off waves and detonate them over the deck. It’s straight out of The Dam Busters. The water whips up from the windward bow and fountains as far back as the chainplates before the boat shakes it all off like a wet dog and accelerates back up to 20 knots. At times there was so much water that I was sailing blind at the wheel. The water sluiced aft, ski-jumped up the forward cockpit coaming that Alex terms a ‘visor’ and cascaded down the front and back of my sunglasses. At one point so much water was forced down the collar of my oilskins that the whole jacket and top part of the salopettes were puffed out like a Michelin Man outfit. When I opened the cuff fastenings the water came hosing out down both arms. Gustav, a freelance journalist from Sweden, bravely decided to get some video footage from the bow. I was still at the helm, wrestling the wheel to dial down as a gust came in. The boat scalped the back of a wave and discharged a solid jet of water that shot 15ft up in the air and all the way back beyond the mast. I couldn’t see a bloody thing. Gustav wasn’t clipped on. Eventually he emerged completely drenched, like a creature from the lagoon. The video camera had been fired out of his hands by the pressure of the water. Even if it had floated – which it didn’t – it’d be gone, baby, gone: at 20 knots you’re covering 600m a minute. Behind me Alex Thomson was in fits of laughter at the scenes of shock and awe, this bunch of seasoned yachting journalists gargling and spitting out sea water as their heads were pressure-hosed. I’ll be writing much more about the boat, Alex’s plans for the Barcelona World Race and the technical changes made to the boat in the January issue of the magazine.